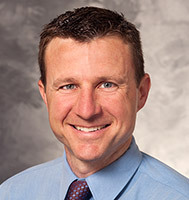 Drew Watson, MD, MS, specializes in primary care sports medicine. Dr. Watson is board certified in pediatrics and fellowship-trained in sports medicine. As a team physician for the University of Wisconsin Athletic Department, he provides medical coverage for the Badger men's hockey team, the men's and women's swimming teams, the men's golf team and the softball team. His special interests include the prevention and management of sports-related injuries, as well as performance enhancement in competitive athletes. Dr. Watson's research interests include pediatric exercise physiology, cardiovascular adaptations to exercise and predictors of injury in competitive athletes.